Art Guild has just completed another iWall interactive project, this one for the American Museum of Natural History in Manhattan (AMNH), a museum where we’ve worked several times before. The iWall, built and installed by Art Guild, is part of a climate change exhibit in the David S. and Ruth L. Gottesman Hall of Planet Earth. 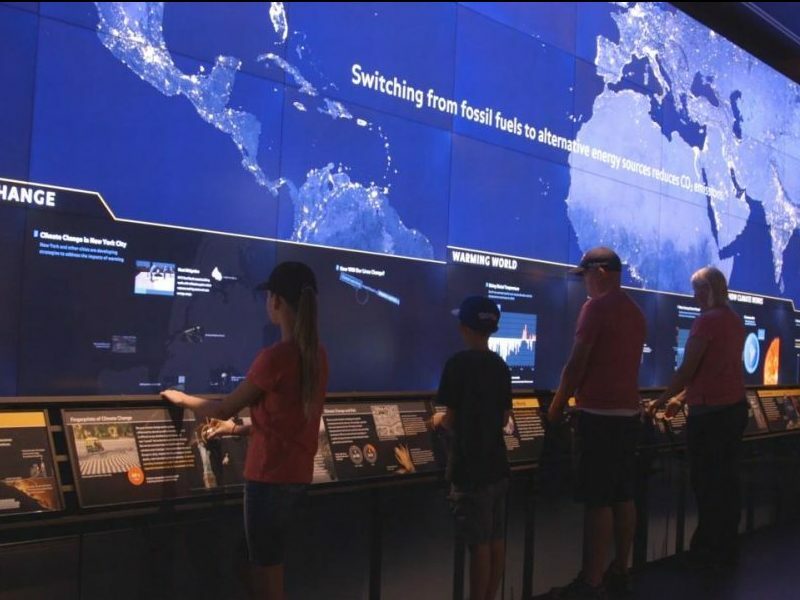 The climate change exhibit – designed by the museum – explores three main themes: How Climate Works, Our Warming World, and Consequences of Climate Change. The new iWall interactive offers visitors a fascinating, interactive way to explore the climate change data offered by an ice core drilled from the Greenland ice sheet. First, a bit about ice cores. Ice cores are drilled in glaciers and on ice sheets, most in Antarctica and Greenland where the ice can extend over 2 miles in depth, and over 100,000 years back in history. They’re typically drilled by a mechanical or thermal drill and produce a long cylindrical section of ice, much like the core produced by coring an apple – a really big apple. The accumulated ice offers scientists a continuous record of events and conditions over the millennium through the chemical changes recorded in the ice and the particles and compounds it collects. The ice core featured in this exhibit is a plastic model of an ice core called GISP2, the second Greenland Ice Sheet Project. After five years of drilling in the early 90’s it produced a core 3053.44 meters in depth, the deepest ever at the time. The bulk of the real core is preserved in sections in the National Ice Core Laboratory in Lakewood, Colorado. The iWall’s sliding viewer allows visitors to walk through the 110,000 years of data offered by the ice core. 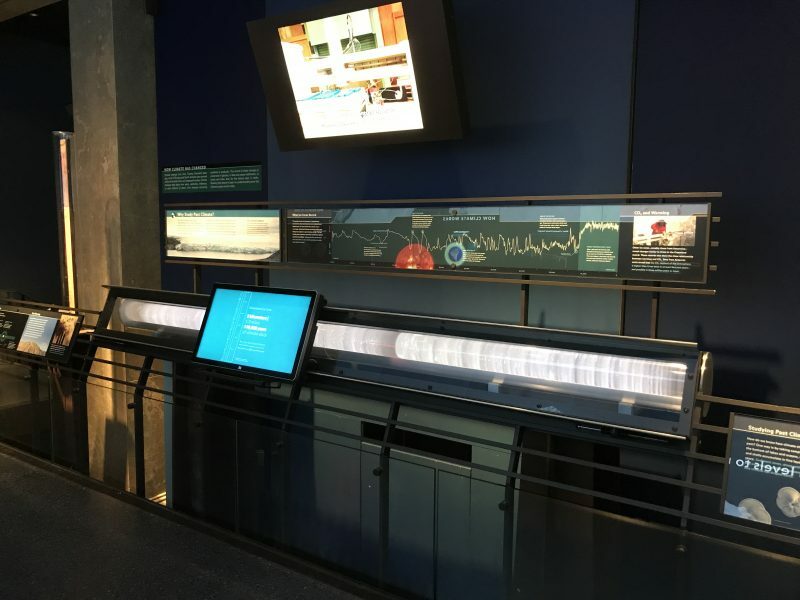 Visitors can see how scientists use the information to understand and compare past and present climates and to help them model how the climate will behave in the future. This particular ice core reveals a close linkage between carbon dioxide (CO2) and global warming, providing more evidence that natural forces alone cannot account for the climate changes taking place today. The photos above show the iWall, another section of the larger climate change exhibit, and ice core segments in storage in the National Ice Core Laboratory. See a video of the iWall in action.